Heartfelt Prayers consists of 60 prayers that will help you express your deepest desires to God. An encouraging message and a specially selected Scripture verse accompany each prayer. A topical index and beautiful artwork by Amylee Weeks makes Heartfelt Prayers an indispensable prayer partner for any woman who longs to be closer to God. Bring your heart's desire and cares to God and leave them at His feet. Simply let go and let God take control. Features: debossed shimmery parchmentlike cover with touches of spot varnish, lay-flat binding, presentation page in the front. 20.3 x 15.9cm. 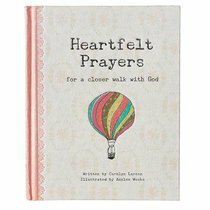 About "Heartfelt Prayers: For a Closer Walk With God"
:Heartfelt Prayers is an uncommon prayer guide for women, written by one whose life is devoted to ministering to women. Within are 60 subjects, captioned with a verse from Scripture, each with the author's personal reflections and her conversational prayer. The prayers are 'spoken' in everyday language, yet somehow preserve the poetry and praise. The message is to feel safe revealing your inner self to Him - expressing yourself to God as you connect with him in your daily life. A 'Topical Index' allows you to quickly find the words that can offer you inspiration and comfort. Illustrated by Amylee Weeks.